In the book by Bremner, "Hoy- The Dark Enchanted Isle" the RITCH's are stated to be descendants from RITCHIE brothers who escaped from the wreck, at Deerness in1679, of the prison ship, "The Crown" which was transporting Covenanters to America. (The Covenanter's memorial in Deerness is dedicated to the loss of those who were not as lucky as our RITCH ancestors). One brother settled in the east and one settled in the west of Orkney, hence the branch differences of the RITCH family in Orkney. Read more about the shipwreck of The Crown. See more information on the Orkney's including a map. John (Jock) Ritch was born on 16 Aug 1905 and died 23 Mar 1979. He married Mary HAWLEY in 1932 (NSW), and then married Elizabeth Newall BLUE in 1938 (NSW). Jock's parents were John Ritch who was born in 1872, and his mother was Mary Skea who was born in 1868 and died at 98 years of age. We can follow their history back to Robert Ritch who was born about 1800. Various ways of browsing this information is given at the bottom of this page. John Ritch married Mary Skea and they had six children, Molly, Jock, Meg, Mima, Bill and Edna. MOLLY married Jim Shearer and had two children - Edna and Ian. Ian lives in Inverness, Scotland and is married to Ann. 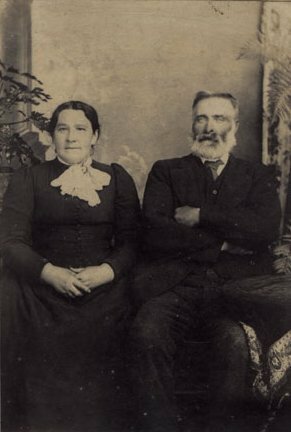 Edna emigrated to Australia as a young woman and married Ken Gray, a farmer near Perth W.A. MEG married Jim Dunnett and is the only surviving member of that generation. She had no children. Kenny Ritch Snr at the back (outside the Italian Chapel on Lamb Holm in Orkney), and then from left to right - Mona (Kenny's sister), William George Skea Ritch (Kenny's Uncle), John (Kenny's brother) and Molly Shearer (nee Ritch - sister to William and Jock). MIMA lived in Edinburgh, Scotland and was brought up by her aunt Jessie, a sister of Mary Skea. Mima married Bobby Skea, a cousin (I believe) and had three children - Moira, who lives in Raleigh, North Carolina (a widow) - Isobel, unmarried, lives in Edinburgh, Scotland - Bob who lives in North Carolina also. EDNA, the youngest sister of Jock died as a young girl at 19 and is buried along with John and Mary (her mother and father obviously) in the Deerness churchyard in Orkney. Jock left Scotland and came to Australia when he was 18 in 1924. We don't know why he left or any other details relating to his reasons for leaving. It is not known whether he left the local port of Stromness, Glasgow on the mainland, or even travelled to England and left from London. We do know that he travelled on the Orsova of which I have some detail. On arrival in Sydney, he had two uncles, David and Ned Ritch who lived in Sydney. They worked for a company called Gillespie who were flourmillers and had share farms in Narromine and Trangie. Jock worked on a share farm for some time and married Mary Harriet Ann Hawley in 1932. 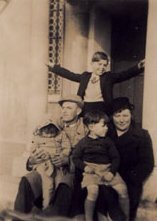 With Mary, Jock had three children. Maxwell was born on 21 Mar 1933. William was born in 1934 but died at six weeks of age. In 1936 a stillborn baby is registered. At some time Jock ran a Saddlery in Grafton. By 1937, Jock had returned to Sydney and in 1938 married Elizabeth Newall Blue. Elizabeth had travelled to Australia when she was 14 with her family. It is believed she was born in 1908. Elizabeth came from Ayrshire, where she lived in a place called Kilbirnie. She would probably have left Scotland from Glasgow. She travelled on a ship called "Hobson's Bay" Elizabeth's fathers name was James, and mothers name was Jane. Elizabeth was the oldest and may have been adopted. James and William were next and Tom was the fourth child who went missing after the war. They lived at 12 Alexander St, Coogee after arriving in Australia. Elizabeth's father James, died in 1954 when he was 71. If I can prove that James was who I think he was, I have details of four more generations of Blues in Kilburnie - going back to James Blue born in 1795, and another 35 Blue's. Jock and Elizabeth had a daughter, Heather who was born on 11 Aug 1938. At some stage, they moved to Melbourne and lived in a caravan behind a house or pub in Johnson St, Collingwood, followed by moving to Adelaide for an unknown length of time. Before David's birth in 1943, they were back in Melbourne, with Jock working at the West Melbourne Gasworks for Haunstrup. When David was six weeks old, they travelled to King Island where they lived for two years. Jock's company, S.H. Haunstrup (?) was involved in reopening a shellite mine at Grassy on the island where Jock drove dozers. The caravan went with them! By 1945 they were back in Melbourne, with Jock having bought a house on Gilbert St, Braybrook (next to the public school). In 1947, Jock moved to Tasmania with Haunstrup, living in single man's quarters in Burnie. He travelled back to Melbourne to see the family every two months. In 1949, the company assured Jock two more years work, so that Jock could bring his family across to Tasmania. They settled on Surrey Rd, Burnie. Jock worked for Haunstrup for over 20 years. In 1964 they moved to Cooee. In 1977, David, Wilma and family moved to the Central Coast area of NSW.